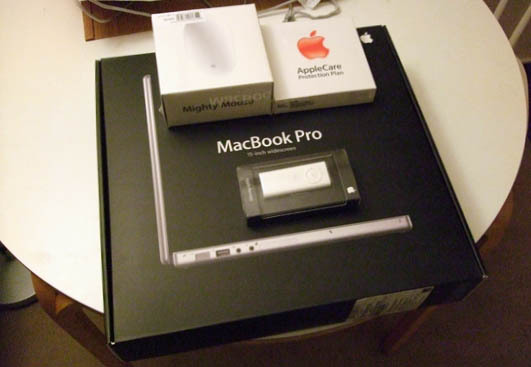 Apple MacBook Pro 15" 2.6 GHz, 200 Gb 7200 RPM. The one with new multi-touch trackpad. But I did not have time to fully configure it yet. So Leopard is sleek, yet it has some issues with russian in iChat and Firefox. It came with 10.5.2 out of the box. I also got a remote control and a wireless mouse. Other upgrades and the rest of accessories will be here later. So far it feels really fast and very cool. Multi-touch trackpad rules. Unboxing an Apple product is a pleasure. For me it means that once Barsik (the comp) is fully configured i will be a lot more mobile and that is exactly what i need right now, because I am on the move. I got my tickets to east coast too. I am flying red eye to Boston, arriving on March 27. Boston, NYC, maybe D.C., dates are not set yet.